It is such a simple word but the worlds that revolve around it are complex. For example, here we are in the week between Christmas and New Years. It seems like a dead zone between the two holidays, like some kind of time vortex or something. I think that is probably because I usually take the entire week off … in fact, a lot of people do. This notion of taking this week off was a convenient concept when I was working out the plot elements in The Fever because the character Sam Milton was just a regular guy who needed a long block of time-off from work for his latest adventure. For that reason, the climatic scenes of the novel take place right about now. You see, Sam isn’t a gold miner, he is a part-time treasure hunter and in his ten year search to uncover the meaning of Slim Longo’s cryptic last words he has failed at every turn. When he finally thinks he has solved one of the clues revealed by the dying man, he knows he will need several days to renew his search. For him, that means using the week between Christmas and New Years. But this past week’s winter storm in west Texas has emphasized one of Sam’s biggest concerns, especially with winter hikes: the unpredictable Texas weather. He always said he wouldn’t go out in the winter because it was a bad plan. Ah, but at this juncture, when he is on the brink of solving one of the clues, he decides he must go out as soon as possible, despite the season. Why? Well … because he is caught in the grips of Gold Fever, and for Sam that trumps common sense. Sure, he says he’ll abort the trip if the weather changes, but will he? It isn’t even about any actual gold at this point. It is about the thought of gold. The potential for a nugget or a few specs of color in a pan is all he can think about and the details get lost in the dream and when that happens … well, isn’t that why we keep reading … to find out, right? How would you feed YOUR Fever? There will be many cold winter nights ahead, warm up and read The Fever and find out how Sam got to this point in time and what happens next. In olden days I processed subscriptions for an academic publisher. Among our many publications, we handled three different political science journals. One day we received a routine renewal for an individual, a woman, living in Southern California. At the time we kept hard copies of all payments, usually photocopies of the check we received (but hey, we’d even photocopy cash if they sent that). If there was a minor problem with a subscription, we might go to their previous payment in our files to completely verify the past and present status of the subscription. I can’t remember the exact problem but it was probably a renewal duplication. We would send out a series of subscription renewal notices, like every six weeks or so. We had apparently already received a renewal from this woman. Duplicates are not that unusual either … somebody is clearing off their messy desk and they find either the duplicate or a copy from another mailing and they forget that they’ve already renewed and send another check. We would routinely extend their subscription. … there was something odd about this latest payment. The earlier check had two different names, a man and a woman, say John Doe and Mary Smith. Again, not that unusual. But the second check had Mary Smith and James Q Public. The renewal was for Mary Smith’s subscription. I don’t know why my office mate decided to do one more check, but she cross referenced James Q. Public and found that HE had his own subscription, but at an address on the EAST COAST! Now, we had some experience with Political Scientists and knew a couple of things. For one thing, they are pretty boring. For another thing, the field seemed to us to be somewhat tenuous. Every summer we experienced what we called the annual migration of the political scientists, meaning they seemed to change jobs a lot. We would get a ton of address changes every week during the summer for our three political science journals. This happened every year for the eight years I worked there. But this was different. We were intrigued. For one thing, what had happened to John Doe? And wait, did James Q. Public need HIS address changed to the new California address as well? Inquiring minds HAD to know! I decided to craft a very carefully worded letter. Yes, I was nosy, but we had some valid concerns here. I mean, was there murder involved? Or perhaps we had uncovered some secret guild of political scientist spouse swappers. So I wrote to James Q. Public (who had after all signed the check) at Mary Smith’s address. He responded very promptly, most of all because I think he was impressed that we had uncovered their subterfuge. Alas, there was no murder and we had uncovered no den of political science impropriety or intrigue. John Doe and Mary Smith had gone on an academic sabbatical. Their friend, James Q. Public, had taken a visiting professor position in Southern California and was house sitting for them. Their sabbatical involved enough time to warrant adding James to their checking account for the duration, so he could pay any incidental items of theirs that might crop up, like this renewal, which she had rushed through herself just prior to leaving. Shucks. Apparently Political Scientists ARE boring after all. I’m sure we all have them. Crazy Christmas Memories, I mean. My craziest goes back to Christmas 1970. I’m always reminded of this by the movie Christmas Vacation. I was a freshman at a college about an hour north of Houston. Some Houston friends offered to come up and get me, but they had an ulterior motive. They wanted a Christmas tree. Now the area around Huntsville TX, where my school was located, is littered with all manner of evergreens, so it seemed like a fairly doable idea. We pulled off the interstate and drove down a side road and found a suitable sapling, like one about nine feet tall. Unlike the movie, my erstwhile friends did indeed bring an ax, or to be more accurate — a hatchet. Working in the dark, and hacking away furiously before a car came, we all took turns and managed the down the tree, a scrub cedar. It was at least somewhat Christmas tree shaped. Ah, but what everybody forgot was … rope. We were in a red VW beetle and we had nothing we could use to secure the tree. The solution? Everybody sacrificed their belts. Somehow we got the tree tied to the top of the VW but I think we lost a foot off the tree by dragging the top along the highway. It really did look like the car in the movie, except we didn’t have the roots. It was completely draped over the car, with the tree-stump clearly visible from the windshield. We did okay for about 30 minutes but eventually we had a minor problem caused by the wind shear and the weight of the tree and the drag caused by the … well, caused by us dragging part of the tree behind us. The problem? Well, all the belts snapped and we lost the tree on the highway. It was rush hour, with tons of traffic, and our tree was rolling along in the lane behind us. We screeched to a halt and pulled over and ran back and somehow dragged the tree off the road without getting ourselves killed. By some miracle, we managed to get enough strands of our broken belts wrapped around a few branches and we were able to again secure the tree. We continued on our way, but now we were less concerned with maintaining full highway speed. A couple of us kept a firm grip on a branch on each side of the car as well. Decorations were sparse that year, but we had a tree! Actually, I’m surprised we didn’t end up arrested or dead. Both options were a distinct possibility. What were we thinking? I think that answer is best represented this way: NOT! My handy iPhone Random Number Generator app picked “5” … and Robyn Echols is the fifth comment … so she wins! Robyn, drop me an email at thefensk@yahoo.com so we can exchange details. With so few entrants, I didn’t feel right about using the random number generator once, so I did it six times (without looking — for the six entrants) just so it would seem a little more random and fair. Sort of like mixing up the pieces of paper in the hat. I want to thank everyone who participated, either by viewing posts on my site or by entering the contest. It was a record day for this blog. Hope everyone has a wonderful Holiday Season! I’m happy to be a part of this holiday blog hop … so let’s get to it! Christmas plays a special role in various scenes of my novel, The Fever, and because of that, I am pleased to offer a special Christmas giveaway. Details are at the end of this post. 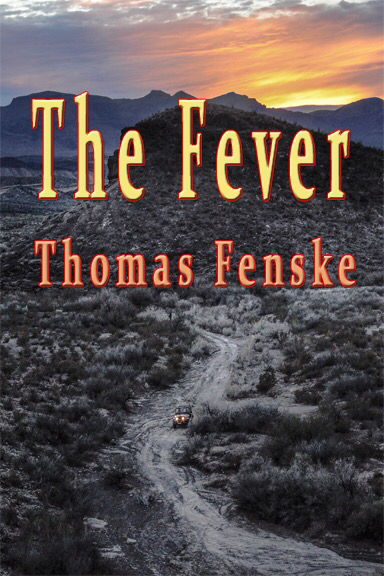 The Fever is the story of Sam Milton and his obsessive search for a lost gold mine in the desert southwest. He has no map, only the words of a dying alcoholic, who wheezed out a cryptic riddle on the floor of a jail cell. Yes, Sam has The Fever, gold fever, and he spends years searching, even trespassing, until, finally, he thinks he may have solved the first part of the riddle. Join Sam as he makes a desperate attempt to solve the riddle and find the elusive gold. Oh, yeah, the giveaway. I am giving away one paperback copy of The Fever as my Christmas present to one lucky person. Simply leave a comment below in the blog. Facebook readers should click the post to go to the wordpress version of the blog. Only the wordpress comments will be considered. Leave only one comment. Selection will be by random number at noon Wednesday the 9th and the winner will be posted at that time — check back to see if you won. Thank you for your interest. What is “The Fever” ? THE FEVER is a novel about Sam. He is just a ‘regular guy’ who happens to be obsessed with a lost gold mine. In short, he’s got Gold Fever. Don’t take my word for it, read the reviews on Amazon … then buy it and see for yourself. Oh, and it makes a great gift. Give someone “The Fever” for Christmas! I was very fortunate to meet the photographer of the cover photo (mumble mumble) years ago when she was about four years old. Jessica Lutz (jessicalutz.com) is an awesome photographer/writer/artist who lives in west Texas.